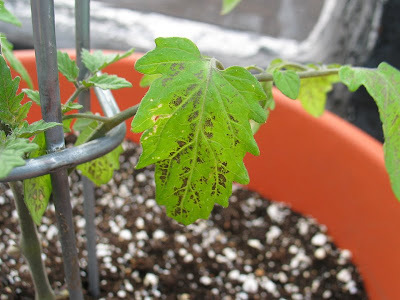 I noticed discoloration on the lower leaves of my tomato plants so I searched through the books I owned for a cause, problem was none of the books had detailed photos to accompany their disease descriptions. I had a hard time narrowing down the possibilities so I put the books away and went to the web. The Texas Extension Office has a great guide to identifying tomato plant problems, the Tomato Problem Solver. They separate the site into 5 sections: green fruit, ripe fruit, leaf, stem and root. Clicking on a link takes you to a list of disorders with nice, detailed pics of their symptoms. No more second guessing! Turns out the tomatoes have phosphorus deficiency. Phosphorus deficiency is most often manifested as purpling of the leaves, particularly the leaf veins. In severe cases the whole plant may take on a purple hue. Tomato roots growing in cold soil, either in the greenhouse or the field, take up phosphorus poorly. It has been continually cloudy and rainy since I transplanted them so I'm not surprised this happened. The celebrity tomatoes were mildly affected and are already bouncing back so I'm not worried about them, but the cherry tomato looks pretty sad. I'm going to cover the soil with black plastic mulch, add some more container booster mix and hope for the best. Perfect! I bookmarked it as I am sure I will need someday soon. Thanks for the info! I had the same discoloration problem with the cherry tomatoes! Thanks! Now I know what the problem may be.And It was raining and quite wet these past few days here as well. Good link. It's a nice resource to have on hand. I don't/haven't had problems with tomatoes except for the wife planting too many. Knock on wood.